Cricket Australia have unveiled two strong Australia A squads to tour England in the lead-up to the Ashes later in the year, headlined by Test hopefuls James Pattinson and Matthew Wade. The tour comprises five one-day matches and three four-day matches, which includes a final match against the Australian team. The match against Australia is set to be used as a final hit out for every Ashes candidate, before the squad for that series against England is announced. Test captain Tim Paine has been included in the A squad as skipper, while Josh Hazlewood will play in both the one day and four-day series affter being overlooked for the World Cup squad. Wicketkeeper Matthew Wade, who many thought should have made a return to the Australian squad over the summer, has been included in both squads, although will likely play as a specialist batsman with Paine taking the gloves in the four-dayers. Former Test vice-captain Mitchell Marsh is also in both squads. Potential Ashes candidates Chris Tremain and James Pattinson have also been included to play in matches against Sussex, the England Lions and Australia, while Jackson Bird could also push his claims after a strong Sheffield Shield season. Michael Neser and Jon Holland round out the attack, with Holland replacing Agar between series. Many of Australia’s batsmen who aren’t guaranteed of spots in Australia’s best XI when the World Cup rolls around have also been included, with Marcus Harris, Kurtis Patterson, Will Pucovski and Peter Handscomb all in the touring party. 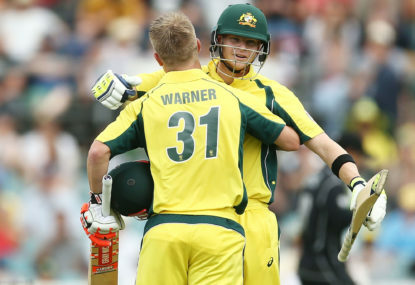 The quartet were all either in Australian squads or XIs over the summer, and will push for selection in the Ashes squad, although the task has become tougher with David Warner and Steve Smith’s return to the national set-up. Some other players in line for an Ashes berth – most notably Joe Burns, who scored a century in Australia’s last Test – have missed selection, however, selector Trevor Hohns said they are being monitored by the selectors in county cricket. “We have Joe Burns, Cameron Bancroft, Marnus Labuschagne, Matthew Renshaw, Peter Siddle and Daniel Worrall in our sights,” Hohns said. “They have not been included in the squad and will continue to play through this period with their County teams. Paine’s Test deputy, Travis Head, will also feature in both squads, captaining the one-day outfit, while Peter Handscomb – a surprise omission from the World Cup squad – has been included. Should Alex Carey be hit by injury at the World Cup, one of Wade or Handscomb will be required to join Australia’s squad in the tournament. Kane Richardson, Sean Abbott and Ashton Agar round out the one-day bowling attack, while explosive opener D’Arcy Short, Ashton Turner and young gun Will Pucovski are also in the side.